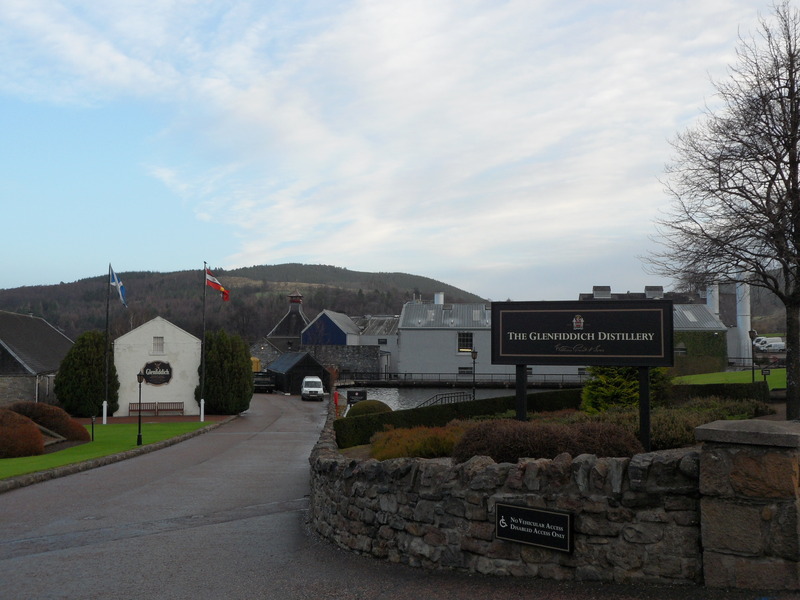 The third distillery of my Scotland tour was a visit to the world’s most awarded Single Malt Scotch whisky, Glenfiddich. Taking a short walk from Dufftown, the malt whisky capital of the world, in rather blustery conditions, we arrived to a rather picturesque setting. With mowed lawns, lakes and wide open spaces, it was as if you were walking in to someones front garden! Greeted by Katya, our tour guide for the morning, we started out with a brief talk on Glenfiddich itself, including the history of William Grant and his dream in 1886 of creating ‘the best dram in the valley’. She explained that William Grant had the use of one stonemason to build the distillery, using 750,ooo stones and only a year later, with the help from his 7 sons and 2 daughters, Glenfiddich distillery was up and running with the first drops flowing from the stills on Christmas Day 1887. To expand the ever growing vision, Charles Gordan (William Grants son-in-law) in 1909 travelled from as far as Lahore in Pakistan to the vast empire of China and to countires like Brazil and Hong Kong inbetween to make sure that Glenfiddich could be enjoyed by everyone world wide (over 180 countries enjoy Glenfiddich to this day). 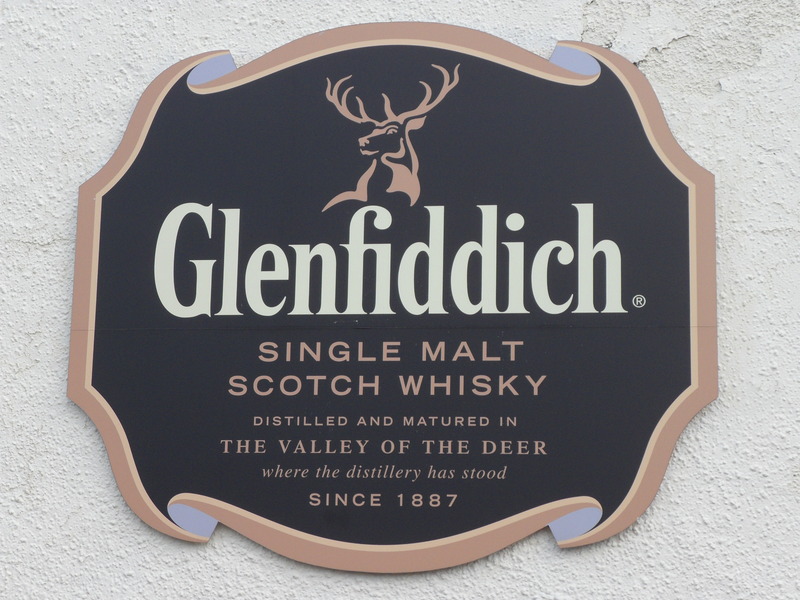 Glenfiddich is still owned by the William Grant & Sons company, with 5th generation Peter Gordon taking the helm since 2008. We made our way to the ‘Lauter Tun’, where Katya showed us the malt that Glenfiddich use. Specialist maltsters are used due to the high demand, where barley is steeped in fresh water for two days. The reaction of germination occurs where it is then left for four to five days before being dried. Glenfiddich then take delivery of the malt barley and taken to be mashed. 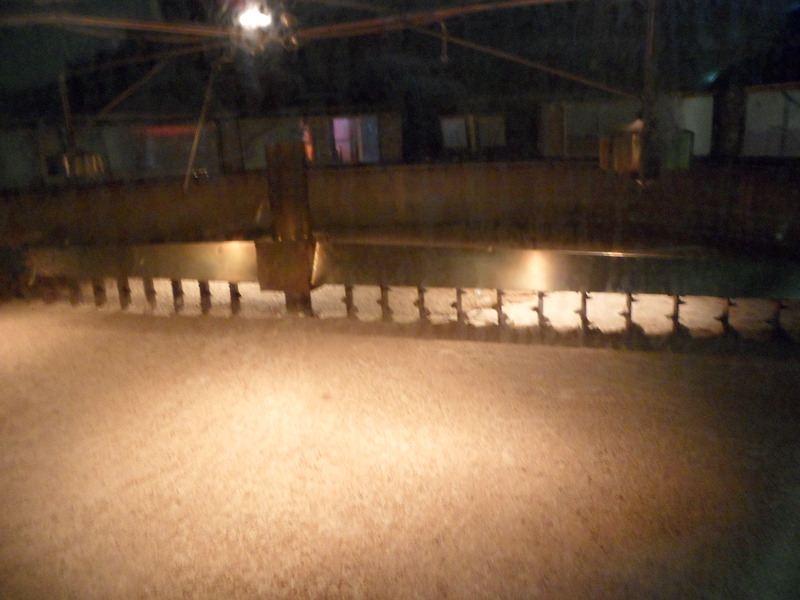 The malted barley is grinded into grist which is then poured into huge ‘mash tuns’. These huge steaming vats combine Robbie Dhu spring water from the nearby Conval Hills where it is then slowly rotated using a set of mash knives that lift and sift the mash to ensure the sugar doesn’t settle. The hot spring water completes the conversion of the starch to sugar, which dissolves into the water, producing a sweet liquid called ‘wort’. The whole process takes around six hours later. The next stage involves the draining of the mash tun and once cooled, it is pumped to the fermentation room. Katya mentioned that the ‘draff’, which is the left over barley from the mashing process – is sold to local farmers to feed to their cattle. We entered the fermentation room where lines of wooden ‘washbacks’ house the wort. All of the washbacks are made from Douglas fir and stand at 5 metres high. Yeast is added to the wort which raises the temperature from around 19°C to about 33°C. The resulting carbon dioxide gas created by the reaction creates a hot frothing head to the wort. This creates a layer of foam that takes up around a metre from the top of the washback and has to be kept down with mechanical beaters. After spending around 64 hours fermenting, a ‘wash’ is created, with an ABV of 8-9%. Katya then showed us to one of the warmer rooms on the Glefiddich site, the still house. 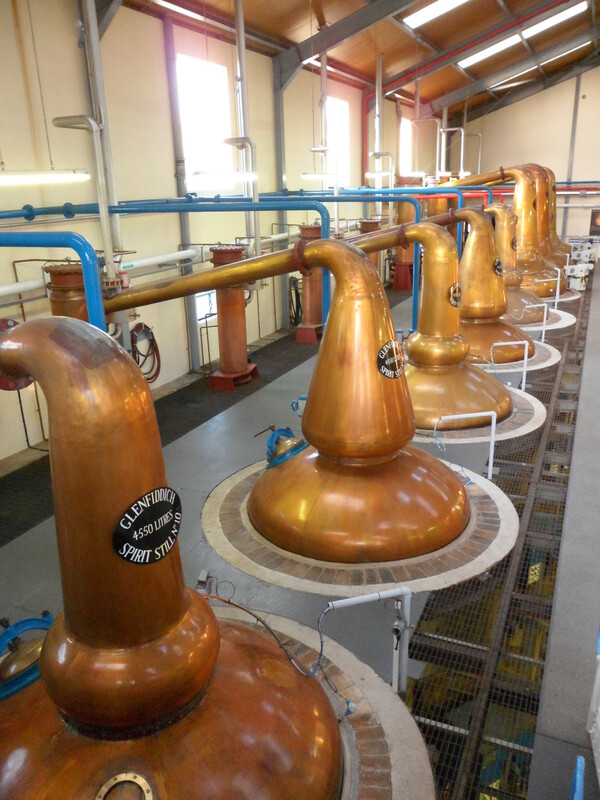 14 copper pot stills are housed in the heart of the Glenfiddich distillation. She explained that if any of the stills become damaged or are deemed out of action, a cast of the still is made so that the exact same still can be made again for continuity of the flavour each one produces. 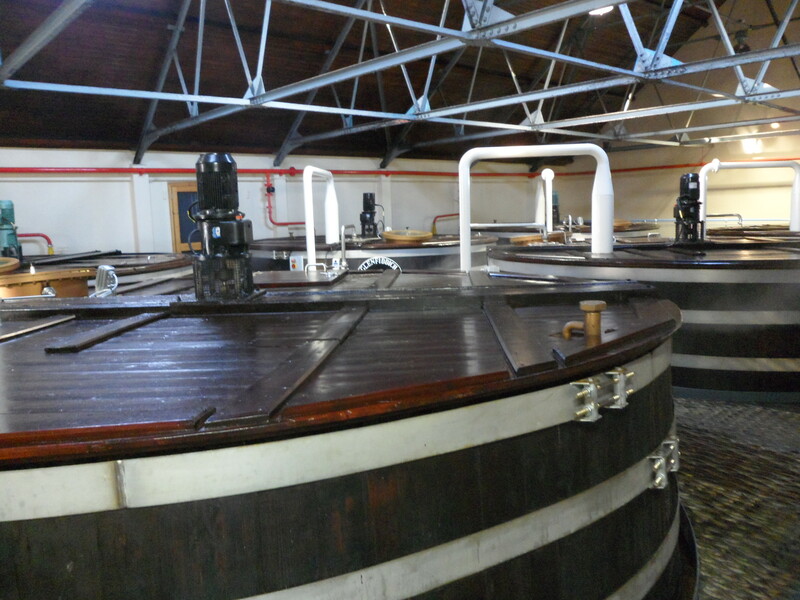 Each still is heated by ‘directed firing’, a huge flame that is located underneath the still, which causes the alcohol from the wash to rise and turn into vapour. As the vapour rises, its guided towards the neck of the copper still and is collected in the condenser. Cold water condenses the vapour into an intermediate liquid, known as ‘low wines’. The low wines contains around 21% ABV and are pumped to smaller ‘spirit stills’ and heated again. The vapourised alcohol rises again and trickles down into the spirit safe. Here, the spirit can be controlled and the stillman then decides the ‘heart’ of the distillation which is chosen for maturation. This new batch is reduced to around 63% alcohol with the natural spring water from the Robbie Dhu springs, and then filled into oak casks. Katya took us to one of the warehouses, a damp, dark and very cold store that housed row upon row of various aged casks. Glenfiddich only use one time filled sherry and bourbon barrels because the oak helps mature the whisky and create subtle flavours. Katya mentioned that they sometimes char the inside of the cask with a blast of fire to re-open the grain of the wood. This aparantly allows the Scotch whisky to interact more easily with it. 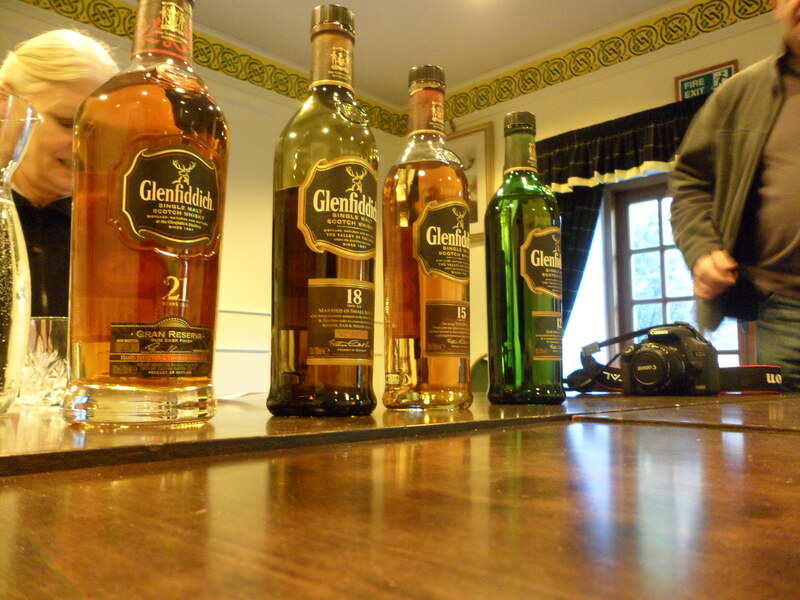 Also, around 2% of the whisky is evaporated each year because of the climate that Glenfiddich endures. When the spirit has matured to requirement, the casks are emptied and the whisky is ‘cut’ using pure Robbie Dhu spring water. This reduces the alcohol by volume once more to around 40% ABV and then nearly all of the Glenfiddich range is then bottled on site at Glenfiddich. A pre-dinner drink, on the nose it gave off a fresh pear aroma with a lemon and lime citrus follow through that gave the 12yr a rather fresh smell. Upon tasting it gives you an instant mouth-watering sensation with the pear coming through stronger with a sweet surrounding. Hints of malt are thrown in for good measure although the pear is clearly the dominant flavour. A slight spice tingles your mouth but it gives a smooth finish that lasts for a good few seconds. The Glenfiddich 15yr is matured in three casks – sherry, bourbon and new oak and the process is called the Solera system. Because of this, the aromas coming out are softer than the 12yr, with hints of vanilla and honey blended together. You get a warm tingle to begin with when tasted, with the sherry oak flavours coming through followed by the ginger and cinnamon. It leaves you with a pleasant smoothness with a sweet spicy end. On the nose, the 18yr gives you a rich fruit aroma with an almost spiced rum effect. The spice becomes a little gentler upon tasting with the flavours of the fruit coming out with the mix of oak to give this a slight warm yet gentle short finish. With a little splash of water, you get a smoother drink although the spice remains. The Glenfiddich 21yr spends 4 months in a Caribbean rum cask to give a strong and intense banana and toffee aroma with hints of leather and a rich sweet follow-through. Upon tasting, it enters your mouth rather smooth with a slight smokiness and ginger and lime extracts. It leaves you with a long warmth after-taste with subtle spice hints. For other Glenfiddich expressions, click here.Yet another fantastic insight into the workings of a whisky distillery, where after visiting two already, both myself and my father started to understand the lenghty process that is endured to create something that is sometimes just taken for granted. I’ll be back! Take a look at the rest of the photos taken at the distillery here. the box using the “Eraser Tool” to make it appear as if the chest and arms are connected. rice, multigrain cereal and potatoes, and fist-sized portions of vegetable and fruits. Read original article Sattva Steps on Cairo360Article Source: reviews and Cairo guide on Cairo 360.